Pablo Picasso, 1955. Source: beardedroman.com. Pablo Picasso's work is universally known and unmistakable. His career defines artistic freedom; never committing himself to a particular style, his artistry evolved with his inspirations, surroundings and inner hauntings. The upcoming Toronto exhibition Picasso: Masterpieces from the Musée National Picasso, Paris, has toured globally, opening up the paradoxical world of Picasso as artist, sculptor, innovator and tastemaker to thousands of new fans. The exhibit's focus on the overwhelming influence of Picasso on the artistic world ultimately raises the question of how current trends stack up against Picasso's own creations. In order to understand the work, it's often important to understand the creator. With Picasso, however, although many have attempted the feat, he was notoriously hard to describe. "Picasso reveled in the fact he was a paradox. That is to say, for every way you might describe Picasso, the opposite is also true," comments Shiralee Hudson, Interpretative Planner at the Art Gallery of Ontario (AGO). An artist with such high profile work still remains a high profile mystery. It is this mystery and complexity that allows Picasso to do what he does best: "represent the 'inner reality' of the people around him, both friends and lovers...he couldn't help but portray the personalities that surrounded him in his works, in a very public and often exuberant way," explains Hudson. Picasso had two wives, four children by three women, and numerous lovers. Seven women were of importance to Picasso's art. Mark Hudson elaborates in The Telegraph: "Each [woman] stands for a different period in his career, representing a complementary or opposing ideal that inspired the evolution of a new visual language." In his attempts to keep his private life a mystery and hold his best work dear to his heart, Picasso fostered a private collection. The Picasso, Paris exhibit is a fusion of "public" work and some of Picasso's private collection; the exhibit combines what Picasso wanted the world to see and that which he did not. Shiralee Hudson also points out that Picasso was also "very much inspired by African Art and the work of many other European artists, such as Velásquez, Degas, Cézanne and of course Matisse, his friend and rival." Picasso's ever changing and evolving artistic genius has led to his worldwide influence today. [Picasso] would still wear his timeless Jaeger-LeCoultre watches, pairing them with a Jean Paul Gaultier Breton-style jumper and Comme Des Garcons F/W 2012 cardigan and slacks. Picasso would own an iPhone, not a Blackberry. Picasso's evolvement of a "new visual language" is clearly evident in society's current tastes. His daughter, Paloma Picasso, is a world famous jeweller whose designs are as bold and multitudinous as her father's art. Her work for Tiffany & Co. spans thin delicate lines, reminiscent of Picasso's line drawings, to chunky and geometrical shapes, akin to Picasso's works during the Rose and Blue Periods. Pop singer, Lady Gaga, has been acclaimed as "America's Picasso" by Tony Bennett because "she changes every day, and she has unlimited energy. And each thing she does is wilder and greater than the thing she does the day before." Here, Bennett is alluding to Picasso's numerous artwork phases, prolific career, and exuberant vision. Raf Simons, former creative director of Jil Sander and recently appointed creative director of Christian Dior, affirms Pablo Picasso as "the icon of Modernism." Jil Sander's S/S 2012 collection under Simons showcased three crew-neck sweaters featuring elements from some of Picasso's ceramic work. The pieces are a direct reference to Picasso, and Simons' collection, a distinct homage to modernism. Even the runway layout alluded to the geometrical shapes and primary colours of the period. The works of acclaimed architect Frank Gehry also undeniably echo elements of Picasso's art. Shiralee Hudson underlines that Picasso's influence in Gehry's work is especially true for the Museo Guggenheim Bilbao. "Its swelling curves and disjointed fragments certainly are reminiscent of Picasso, and Gehry, like Picasso, had a unique vision of the world and transforms that vision into stunning architectural creations." Visitors of the AGO's Picasso, Paris exhibit will experience the best of both worlds - upon the completion of the exhibit, patrons exit into Gehry's Galleria Italia, a transformation opened to the public in 2008. This summer, AGO is bringing Picasso to the table in more ways than one. AGO's Frank Restaurant is hosting a Picasso-inspired menu throughout the Picasso, Paris exhibit. The menu will be composed of five Paella dishes, such as the "Paella Valenciana" featuring rabbit, spicy chorizo, snails, fresh fava beans and saffron. Shiralee Hudson comments that she believes the exhibit, extension, and Frank's menu would "make Picasso quite happy." It seems that Picasso never fails to amaze: "What cannot be denied is that Picasso, today, 40 years after his death, still captivates the public imagination. A protean figure, no one saw the world like Picasso, his multitudinous ways of seeing the world, the human condition, was completely unique," trumpets Shiralee Hudson. This leads us to ponder what Picasso would have thought of today's trends in design, fashion and art. If Picasso was still alive, he would bask in his own influence and still be one step ahead. He would still wear his timeless Jaeger-LeCoultre watches, pairing them with a Jean Paul Gaultier Breton-style jumper and Comme Des Garcons F/W 2012 cardigan and slacks. Picasso would own an iPhone, not a Blackberry. He would own at least one piece of furniture by Astier de Villatte (particularly the Table Hollondaise Rectangulaire) and hang his hand-knotted Turkish nuLoom Kaveh Overdyed Rug in Blue on a wall in his home. He would pursue painting First Lady Carla Bruni-Sarkozy passionately. Picasso would still consider himself a "bohemian everyman," according to Shiralee Hudson, while lounging in the slums of Montmartre, coming back to his luxurious Parisian apartment, and visiting his grand chateau estates in Southern France on the weekends. In the early hours of the night, he would fill the pages of his plain Moleskin notebook in black at the LeMéac Café Bistro in Montreal before catching a red eye flight back home. At home, he would place the filled Moleskin on his Between Lines bookcase and head to his studio to start a new masterpiece. Picasso's favourite movie would be Vicky Cristina Barcelona (2008), but this would be in secrecy due to his detest of Woody Allen's narcissism and American irony. Although Pablo Picasso passed away several decades ago, we are still tasting the sweet aftermath of his artistic evolution. The taste of Picasso lingers in our fashion, architecture, music, art, and even cuisine. We can construct his identity today by comparing his creations to our current iconic products. We could all do well to imagine what Picasso would do if he were still creating today, and incorporate a bit more of his creativity, imagination and boldness into our own lives. 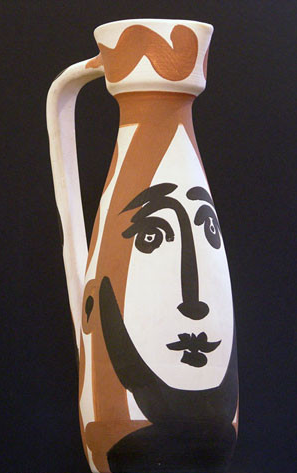 The Picasso, Paris exhibit opens on May 1, 2012, at the Art Gallery of Ontario, Toronto, Canada.